Finally, a sunny morning dawned today, and it was the perfect opportunity for a stallion shoot. Today we put the Arabian colt Renegade Angyl through his paces on a crisp September morning. This was his first official conformation session, and he was quite accommodating as trainer Larry Jones set him up to look his best. After the formalities took place in the ring, we went down into the adjacent field and Renegade enjoyed romping and playing on the end of the lead. 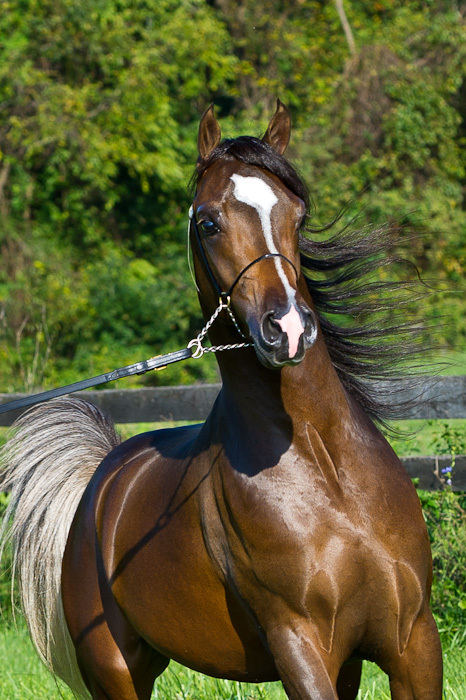 With his extreme athleticism and elegant movement, Renegade was a sight to behold as he showed off the vibrancy of youth and the beauty of the Arabian breed. As a child, I collected Breyer horse models and dreamt of owning an Arabian like the resin ones that lined the shelves in my bedroom. If I’d seen Renegade way back then, there’s no doubt I’d have painted all my Arabian models to match his stunning and unique coloring. Now that is one handsome horse indeed!! Amazing! You so capture the movement and excitement of the moment. Thank you, Patti! It’s fun to photograph such beautiful creatures. Thank you, Nia! It was fortunate timing to get the mane flying in the wind. Thank goodness for our high speed cameras!